The "Output Profiles" frame contains a table with all input output profiles. The name of profile and the coordinates of the point, which define a profile, are visible in the table. Next to the table, the selected profile is displayed. Visualization of drawing on the desktop can be modified in any input mode based on the setting adjusted in the "Drawing Settings" frame and with the help of buttons on the tool bar "Visualization". The "Undo" button is an important program tool. It allows to return back to the original state before any modification. 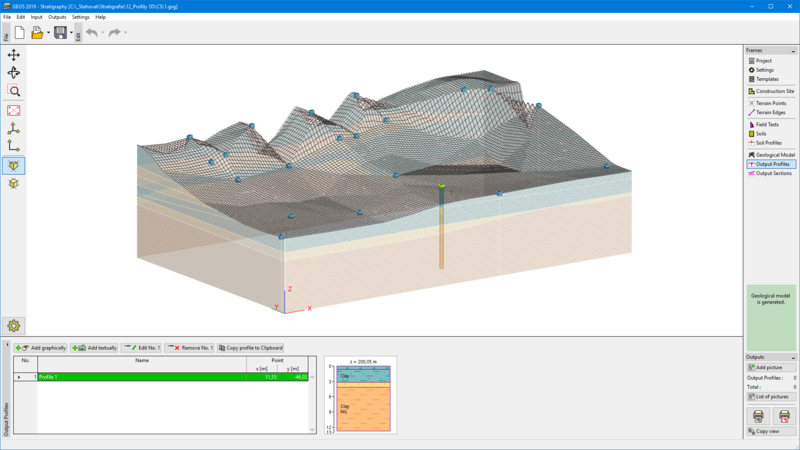 Data of 1D profiles can be copied within other GEO5 programs.